From 16th to 17th March Gartner - the leading company for market research and analysis of the global technological industry - invites to the Business Transformation & Process Management Summit in London. 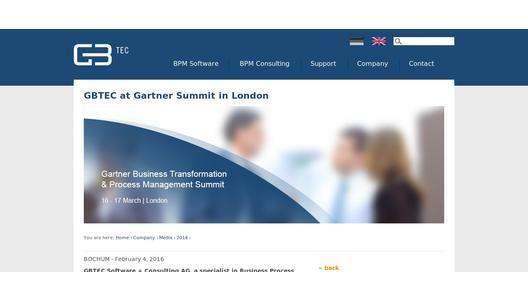 The Bochum software and consulting company GBTEC, provider of the BPM-Suite BIC Platform, will participate at the Summit and is available for discussions and an exchange of experience. 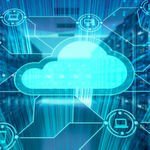 Against the background of the growing digitization, increasing customer focus and tightening regulatory frameworks the Gartner-Summit deals with the question of how process management generates operating benefits within companies. The latest findings, concepts and technologies for a profitable redesign of processes will be presented. Especially the holistic combination of business process management and operative daily business in London are in focus. A powerful tool for realizing BPM holistically is a central prerequisite. The comprehensive, cloud-enabled BPM-Suite BIC Platform meets all requirements for a future-oriented and innovative BPM. Multiple awarded, the solution provides with its modular design all relevant functions for optimizing business and IT processes: from planning, through modelling, analysis, publishing and implementation to automation. Especially the user-friendliness during the development was in the focus. The result is a user-friendly and intuitively designed BPM platform. It guarantees high acceptance in companies with rapid implementation. Interested persons are invited to get more information about the innovative BPM Suite BIC and individual consulting services of GBTEC at the Gartner Business Transformation & Process Management Summit. To arrange a personal appointment with our specialist Dirk Stähler, please email: BPM_Summit@gbtec.de. GBTEC Software + Consulting AG is the expert for Business Process Management and IT Management. Our company combines consulting and software development. With its BPM solution BIC GBTEC offers an innovative, full service and powerful BPM suite optimising your processes and IT systems. GBTECs customers are several big DAX groups, large middle-sized companies as well as public institutions. For further information please click on www.gbtec.de.